In Toon Boom Studio, you can set your own preferences to fit your cut-out animation work style. 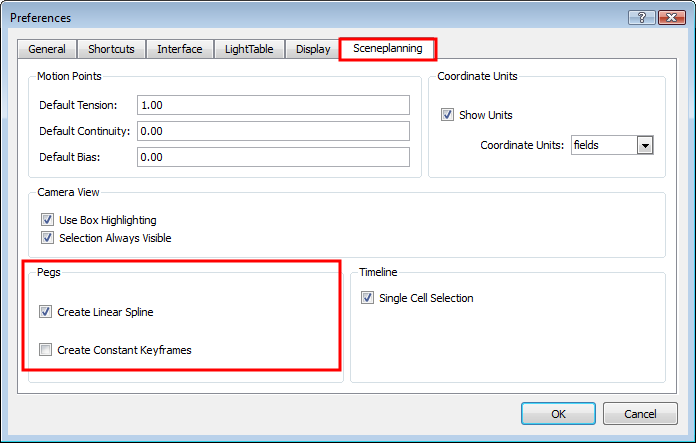 Select the Sceneplanning tab to customize the preferences relative to cut-out animation. When you animate an element with a motion, rotation or scaling, the velocity is set to Linear by default. This means that the motion tweening executed by Toon Boom Studio is straight with no variation in the speed. You can turn off this option by deselecting the Create Linear Spline box, so that every time you create a motion, rotation or scaling, the velocity is set to the default ease-in, ease-out curve. Refer to the Adjusting the Velocity topic to learn more about velocity and ease-in, ease-out concept. By default, the Create Constant Keyframes is disabled. When you create a motion, a non-constant segment is created between every two keyframes and the motion tweening is automatically calculated by Toon Boom Studio. You can create constant keyframes by selecting the Create Constant Keyframes option. Every time you create a motion, the segments between the keyframes are automatically constant segments. No motion tweening is calculated and the position jumps from one to another at each keyframe.